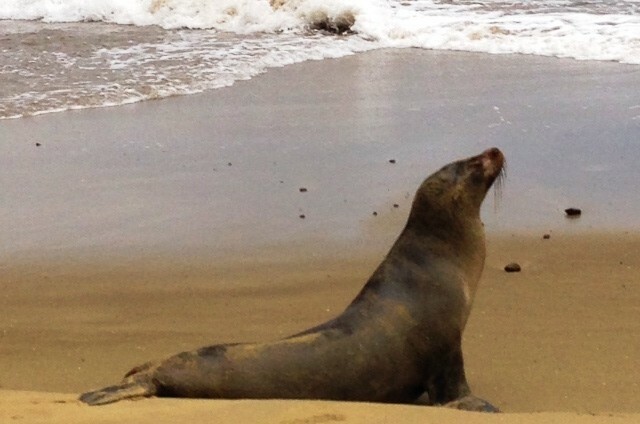 A large sea lion galumphs his way across the sand, his nose pointing disdainfully to the sky, seemingly oblivious to the delighted visitors to his domain. Finning away from him, clad in wetsuit with snorkel and mask clamped firmly in place, I gaze down into cool, clear rippling water. Vibrant blue and yellow fish zig-zag around jaggy rocks. A shoal of silvery fish flickers past and in the distance a ray wafts its elegant way across the ocean floor. I’m swimming at Punta Pitt on San Cristobal, one of the biggest of the Galapagos Islands, 1000 kilometres off the coast of Ecuador. Suddenly, staring up at me are two huge brown eyes, beneath which are pair of very fine whiskers and what, to my idealistic mind, is a benevolent grin. 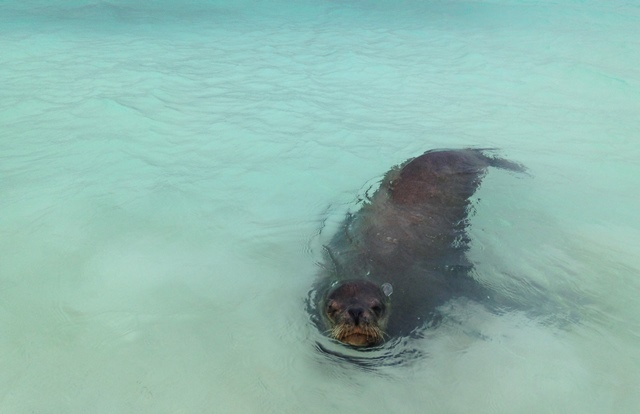 As soon as we make eye-contact, the sea lion twirls underneath me. I twist quickly round and there he is again, staring at me just inches away. He rolls over on his back and swims underneath me upside down. Again I twist and again he’s there, most definitely waiting, enticing me to play. He sinuously swoops in an arc and I try to keep up with him. He does a barrel roll but now I’m ready for him and we both twirl about, my clumsy turns a poor imitation of his balletic grace. He zooms up to the surface for air but he’s soon back, tumbling and swirling, always no more than a few feet away. When he surfaces we are in tandem, rising out of the water and splashing back under together. For what seems like forever, but is probably no more than ten minutes, we dance to the music of time, til I’m exhausted with the aquatic whirling and laughing with sheer, unadulterated joy. Getting a mouth full of water I surface, gasping, pulling off my snorkel and mask. By the time I’ve refitted it and look down again, my playmate has vanished. Everywhere, sea lions of all ages lollop about, laze in the sun, honk and collapse all around us, totally unfazed by zoom lenses, click of many cameras and gasps of delight from their admirers. They seem to get on well with the thousands of sea birds, including the delightful Boobies, albatrosses, frigates and pelicans and the equally prolific iguanas. My excellent guide book, Bradt’s ‘Galapagos Wildlife’ says’ “Probably the strongest memory of any visitor to the islands is the delight felt when swimming and interacting with these two intelligent animals.” The book is referring to the two species of sea lions, the Galapagos Sea Lion (Zalophus wollebacki – quirky name) and Galapagos Fur Seal (Arctocephalus galapagoensis) but I’m also applying it to my two underwater playmates. 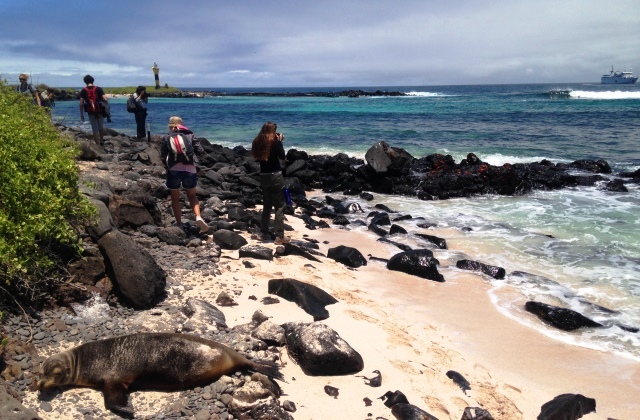 On San Cristobal and Espanola, which we visit the following day, are hundreds of these endearing sea lions. At times we have to edge carefully past them while at others an inquisitive seal pup will galumph up to us to check if we’re its mother, who’s probably off swimming in the turquoise ocean. I’m with a group of travel bloggers, experiencing the very best that Ecuador has to offer – and that’s a lot. 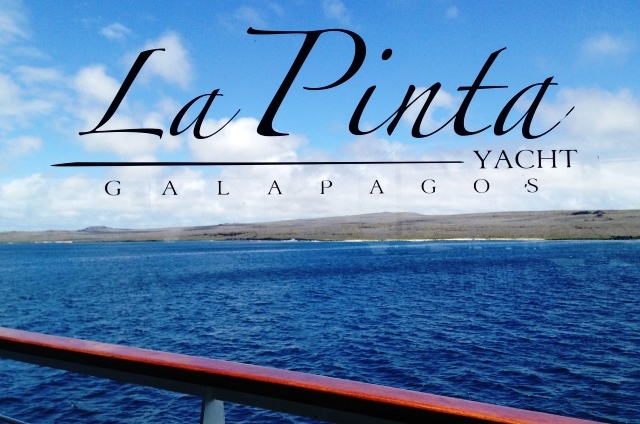 Having spent a few days wandering round the elegant capital, Quito whilst staying at the elegant Casa Gangotena and a fascinating time in the Andes’ cloudforest at Mashpi Lodge, we are now cruising the Galapagos Islands on a large, luxurious yacht called La Pinta. 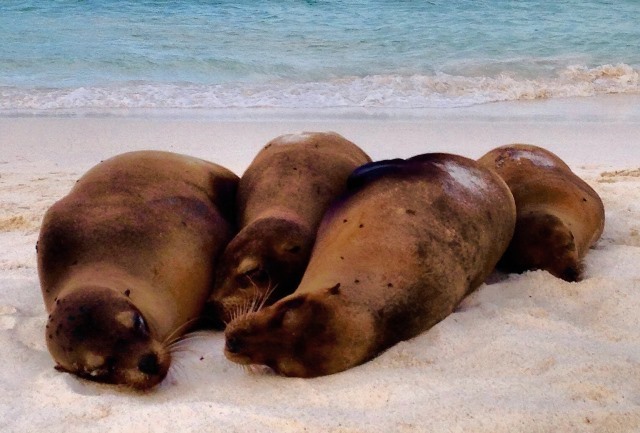 As images of Spanish Colonial churches, busy marketplaces, mist-shrouded treetops, whirring hummingbirds and tiny frogs flitter across my mind’s eye, I know that the sheer joy of swimming with sea lions will be the ultimate, everlasting memory of what has to be the best trip I have ever been on. Swimming with sea lions even beat swimming with dolphins in New Zealand, which is saying something! 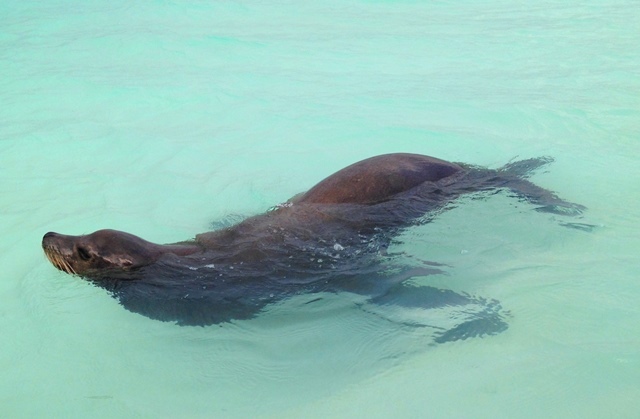 You can see more of the wonderful Galapagos Islands in this video. If you’d like to experience the magic of Ecuador, travel with the experts, Metropolitan Touring in stylish luxury. Many thanks to LAN Airlines for flying us in comfort from the UK to beautiful Quito and the Galapagos Islands. I’d highly recommend cruising round the Galapagos Islands aboard the lovely yacht La Pinta; the friendly and knowledgeable crew add greatly to the adventure. 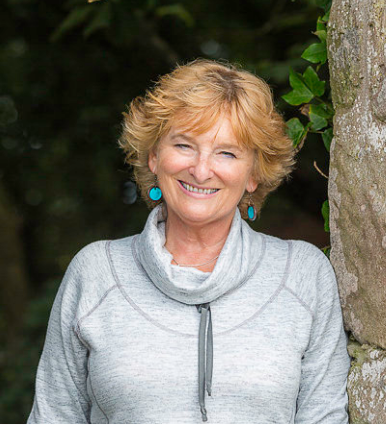 All photographs and views in this article are my own. 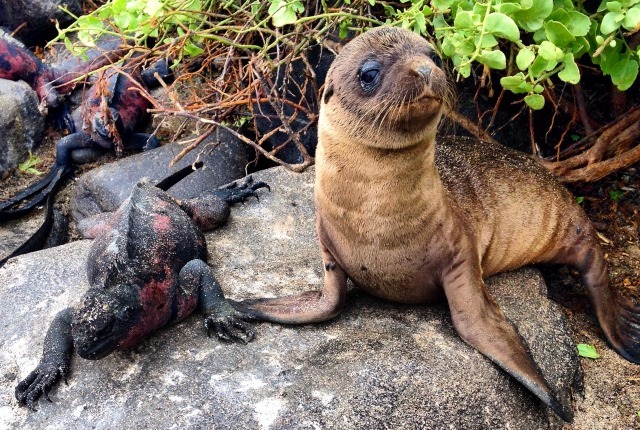 I have wanted to visit the Galapagos Islands since I was about 8 years old. When you dream about somewhere for so many years, the danger is that the place never lives up to such high expectations. (I’m afraid the Pyramids were one such disappointment.) But I can assure you that the Galapagos Islands were 100 times better than I had imagined. Such a lovely encounter, brings back happy memories! Been waiting for this post, Zoe! After following you on FB etc.Really brought it to life! Just as I imagine. This is something I really need to do! 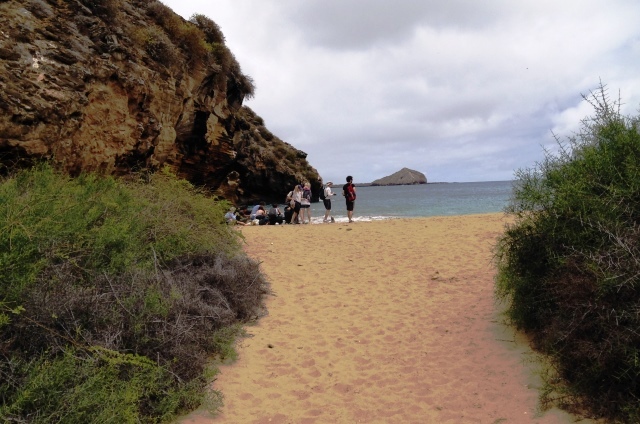 Many years ago I read a book called “My Father’s Island,” by a young woman who grew up there. Can you imagine how magical that must have been! It’s stayed with me all these years. Great book, highly recommend it if it’s still in print! Such beautiful animals – I can see why this is such a highlight of your trip.